While India’s population is becoming increasingly urban (studies project over 40 per cent of India will live in cities within the next two decades), our cities are ill-equipped to cope with the influx. The extraordinary scale and pace of this transition isalready placing an enormous burden on Indian cities, which are already stretched to deliver even the most basic services to their citizens. Increasingly, experts have stressedthe need for a new model of urbanization, where even as we strive to improve live ability, we need to plan and build new future cities. 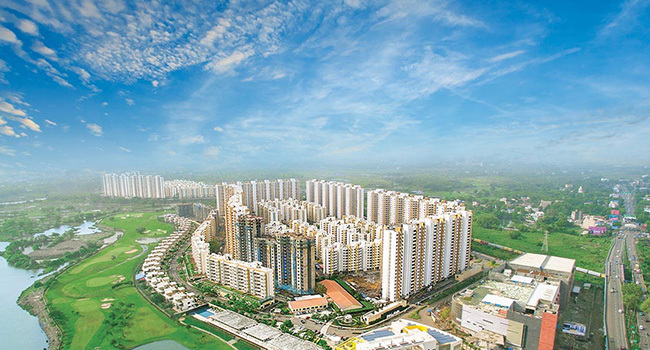 Palava was envisaged by Lodha Group, India’s No 1. developer, as India’s answer to the urbanisation challenge; to provide a far smarter way of living, enhancing quality of lives by creating an opportunity for people to flourish in a better urban environment. Spread over 4,500 acres (1/4th the size of the island city of Mumbai), Palava, Mumbai’s sister city, is the largest greenfield private development, funded, built and governed by a single enterprise. Palava has developed and rolled out several initiatives across governance, healthcare and education, safety and security, transportation, sustainability, and energy and utilities. Currently, phase 1 of Palava which is over 250 acres and has over 18,000 homes is nearing completion and population is expected to hit 1,00,000 by 2017 “In just 7 years from its start, making it the fastest city startup” in world history. Best firms from around the world including GE, IBM, Sun Edison, Philips and many others are already working together to create India’s first greenfield smart city. Palava is envisioned to have a population of 2 million people and provide 3.5 lac jobs. Today, with over 24,000 flats sold and over 5,000 families already living there, Palava underscores the appetite for high-quality middle income housing. Palava offers citizens a greener lifestyle with over 60% open spaces (the highest among world cities), a riverfront park, neighbourhood gardens, high-quality educational facilities like two operational ICSE schools as well as 20 other upcoming schools, sports facilities including a cricket ground, a FIFA standard football stadium and a golf course, luxurious clubhouses and cafes. Opening soon is a 5 lac sqft mall with PVR multiplex followed by a multi-speciality hospital. Palava will also be home to a world-class multi-disciplinary university, an Olympic-standard Sports Complex, a vibrant Centre for Arts and Culture, lakefront and river-front plazas, high street retail and a 100-acre Central Park. All this will give the citizens of Palava a multitude of opportunities for all-round development. Its Central Business District will offer millions of square-feet of world-class offices and the city will create 3.5 lakh jobs by 2025, making the ‘walk to work’ concept a reality for the citizens of Palava. Palava aims to provide citizens a hassle-free lifestyle. Having partnered with IBM for its smart city technology, advanced systems are already integrating information from all Palava city operations into a single system. Centralized monitoring and analytics in the areas of security, emergency management and transportation are further improving response time to city problems. Palava recognizes that it is not only infrastructure that makes a city great. Arts, culture and entertainment play an equally important part in the fabric of any city. Recognizing this, Palava fosters and seeds arts, culture and sports through a participative, citizen-driven process – with the goal of creating opportunities and experiences for the community so as to explore their potential. Last year, the city’s flagship arts and culture festival ‘Palava Tarang’ saw performances by India’s finest artists like Pt. Hariprasad Chaurasia, Dr. L Subramanium and Ustad Rashid Khan among others. Activities like urban farming, creative photography and other workshops are already being conducted towards forming community clubs. Palava’s urban governance model offers a unique and sustainable solution to India’s urbanization challenge. Palava’s own municipal body, Palava City Management Association (PCMA) is responsible for delivering policy and rule-based administration for all stakeholders. Already in operation, PCMA comprises of citizens and city experts which will collectively aim towards cost-effective services. PCMA already administers core amenities like power, water and transport for the citizens of Palava. A franchisee agreement with Maharashtra State Electricity Distribution Co. Ltd ensures that Palava has near-uninterrupted electricity. 24×7 monitoring and emergency response teams, video surveillance, a highly trained security force, street level panic alarm systems, and electronic access control and automatic fire alarm systems in buildings ensure safety, day and night. One of the many unique aspects of Palava will be walkability, making the entire city easily accessible to its citizens and fostering a healthy, sustainable lifestyle. Each neighbourhood has a pedestrian-focused design and is planned to be self-sufficient, with all daily needs met within a 5 to 10 minute walk from home and public facilities just 15 minutes away making Palava a walkable urban city of the future. Palava was built to offer its citizens three things: opportunities to prosper, the chance to participate in the running of the city, and a fulfilling lifestyle. These are the key cornerstones of the city, being fortified by meticulous planning and the desire to match the best. All these total up to Palava being a true city of opportunity for generations to come.